1 flash gordon | This Blog Rules | Why go elsewhere? It looks like something out of a Flash Gordon movie or a feature of a Buck Rogers outer-space adventure. But no, the Citroen U55 Cityrama Currus bus is the stuff of fact and not science-fiction. 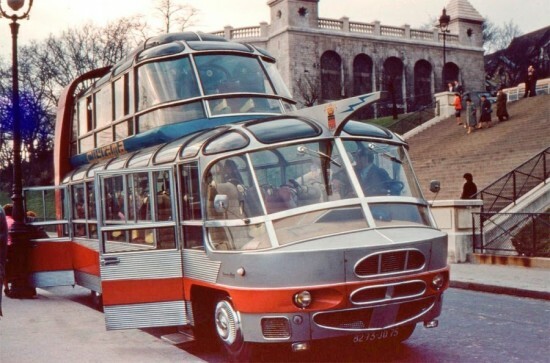 It is also the stuff of the past: this hyper-futuristic double-decker bus was constructed by French coachbuilder Currus in 1950 for tour operator Groupe Cityrama. Cruising through the scenic boulevards of Paris, it served as a tour bus of the City of Love, where Parisian onlookers would routinely stare at its outrageous figure and fear that they had accidentally stepped through a time portal, or that an alien invasion was imminent.